Two times I have lived in Ipanema, a narrow strip of land between the ocean and the lagoon in Rio de Janeiro. A city that has the most wonderful people, the most delicious food and the greatest climate! I guess most of you have heard the famous song The Girl from Ipanema, a luscious Bossa Nova written by Antonio Jobim. He was sitting at a restaurant drinking beer, when he saw a beautiful, young girl passing by. He got inspired to write the song, which is believed to be the second-most recorded pop song in history. The first time I lived in Rio, in 2005, I lived just a couple of blocks from this restaurant. Rio, also known as cidade maravilhosa, the marvelous city, lives up to its name, flanked by gorgeous mountains, white beaches and deep green rainforests fronting the blue ocean. The people, Cariocas as they call themselves, are cheerful and open. They live for the moment usually without a thought about tomorrow! Princesa with a royal view of Rio from Corcovado, the statue of Christ. I admit that Rio has its share of serious problems; still there are plenty of residents and expats like us who wouldn’t dream of relocating. We even moved there twice. Most people we passed in the streets just couldn’t keep themselves from touching our little daughter’s long blond hair saying: Princesa! And that’s about the “worst” memory she has from Brazil, because she was so shy. The economy is now fast growing and the poorest families get an amount of money every month for sending their kids to school, so the wheels are turning and life is getting better for most people. Since my Portuguese was bad, I compensated by using body language. That worked very well. Quite a sight when I went into a shop “asking for” Hawaiian grass skirts and my husband “asked for” rubber gloves at a local grocery store! For Brazilians body language is part of their communication, so they didn’t even lift an eyebrow. However, they thought that if they only spoke louder and stepped closer I would finally understand! After some of these one-way conversations I felt like I’d been hit by a hurricane category three! My old high school French suddenly came in handy! It was amazing how I could understand menus and other written statements, both being Latin languages. Yeah! When we moved back to Rio in August 2008 I started anew with another teacher, but since I managed so well the first time I lived there, my motivation was kind of mixed. I tried to do my best, I really did, but my body language at the end of each lesson was not a very positive one I’m afraid. -This is God speaking and I can see you! End of story! I surely can understand why they got so scared, because they could actually see his son, the mighty statue of Christ with outstretched arms, from their bedroom window. The Cariocas enjoy their life, and so did we. The food is fantastic and my mouth still waters just thinking of picanha, their special beef. Almost every evening we had dinner at outdoor restaurants, where we could watch the street life! The national drink is called Caipirinha, which means small village girl. It’s made of Cachaça (liquor made from sugarcanes) lime, sugar and crushed ice. You ought to be careful -one is enough! This year the Rio carnival is from February 8th to 12th: a whirlwind of colorful feathers and sequins accompanied by samba beat! Each year Rio organizes the Carnival, which mostly involves the poorest neighborhoods in the favelas (slum). 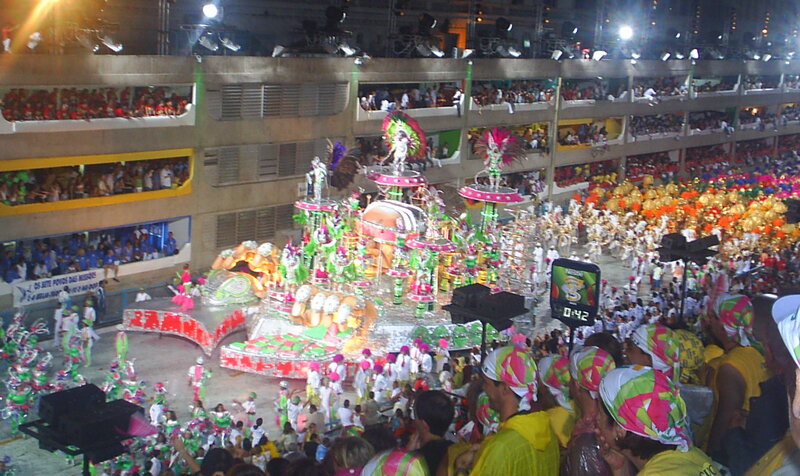 Each participating samba school builds their own float and sews their own costumes. It takes one hour per school to dance through the Sambódromo, a parade street with stands on each side! It’s a colorful firework of sequins and feathers. There are also parades in the streets of Ipanema. Not as professional, but highly enjoyable. Some costumes are very original, like the young girl dressed in body paint! She did fine until it started raining. We saw her trying to cover herself as the paint vanished. Suddenly eight gay guys draped in pastel towels with two meter long q-tips in their hands came to her rescue. They unwound their towel turbans and covered her! Lucky girl! Every morning I and thousands of others greeted the day by walking along the beaches of Copacabana, Ipanema and Leblon, winding like a white ribbon along the blue ocean. Whenever I close my eyes, no matter where I am in the world, I can still hear the waves and smell the salty sea! Hope to see you soon cidade maravilhosa. Great post. 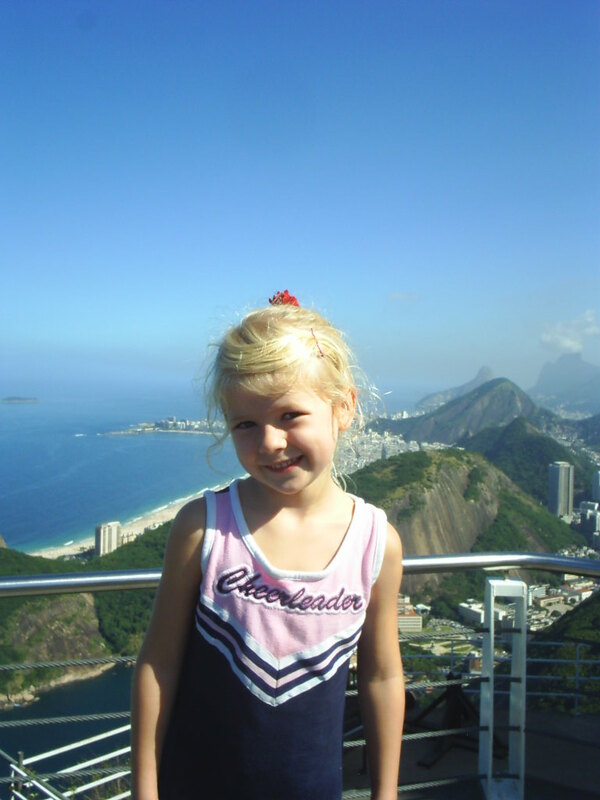 I can tell you like Rio de Janeiro a lot. I also noticed the Angloinfo link on your site. did you know that Rio de Janeiro has its own AngloINFO site since November 2012? check it out: http://riodejaneiro.angloinfo.com. Hope to see you on the forum. If there’s something I can help you with, just ask. Alaska you say? OMG… it must be freezing there right now. Big difference with the 30°c here. I also have a blog about my adventures in Brazil called “Brazil Road Trips” (htp://mirantesmt.com). she told me after being at the Sambódromo : I feel much more brazilian now! This is just so original and and… I have no words to describe it!!! Hi Mariza, I’m so glad you liked it! It means a lot to me that a real Carioca likes it!! Then I have achieved my goal. I’m so glad your daughter loved the Carnival and Brazil! It’s important to groom your roots! Hugs from Heidi!